Over Thanksgiving, I helped my sister put together this yarn wreath for her front door. These are fairly simple to pull together and fun to make. I made this one later to hang in my kitchen. You can find the tutorial for making the larger fabric flowers here at Heather Bailey's blog. 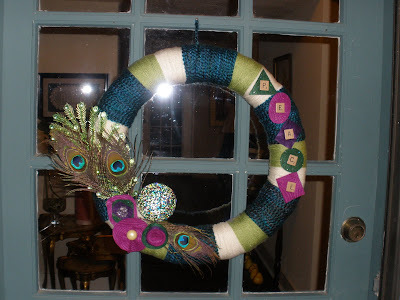 I'll try to do a tutorial the next time I make one of these wreaths. I think a Valentine's Day and/or Easter wreaths would be great too. I bet you could make a nice Christmas wreath with a hill-country theme for your mother. Will you take orders for Valentine & Easter wreaths from your Aunt CHY?